Purple-Silver, crystalline Bismuth has been in use since the early days of alloying, although during those times, it was often mistaken for Lead. It’s the most naturally diamagnetic element, which means it repels both north and south, and it has one of the lowest values of thermal conductivity among metals. 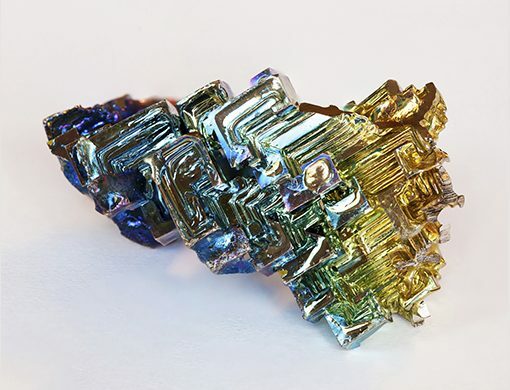 When melted and cooled, Bismuth forms geometric, shiny, iridescent crystals, which quickly oxidize and turn a rainbow of colors—yellow, blue, silver and pink. In the 1950s, the Naval Ordnance Laboratory combined Bismuth with manganese to make Bismanol, which at the time of invention had the highest coercive force of any permanent magnetic material. On its own, Bismuth is brittle, so it must be combined with other materials to bring out its useful characteristics. Beyond crystals and strong magnets, Bismuth can be used as a carbide stabilizer in the manufacturing process for malleable iron, as well as added to low-carbon steel or aluminum to improve machinability. Bismuth is offered in a variety of forms, including ingot, lumps, shot, granular powder, pellets or needles. Because Bismuth is widely used in alloying, metallurgists are familiar with its capabilities. Alloys with less than 48 percent Bismuth normally shrink during solidification, those with 48 percent to 55 percent Bismuth have little dimensional change and those with a concentration of Bismuth above 55 percent usually grow during the solidification process. Fusible alloys (alloys with melting points below 450 degrees Fahrenheit) often contain combinations of Bismuth and Lead, Tin, Cadmium, and Indium. Many of the fusible alloys that contain Bismuth melt below the boiling point of water, and some melt below 150 degrees Fahrenheit. There has been increased demand for many of the low-melting alloys that contain Bismuth because of their low toxicity and minimal environmental impact. Although Bismuth is a heavy metal, it is non-toxic, unlike lead, which is becoming more heavily regulated because of its adverse effects on human health and the environment. As a result, alloys that contain Bismuth are often used to replace Lead-containing alloys in applications such as ceramic glazes, food processing equipment and brasses for plumbing. Lead-free copper, for instance, uses Bismuth to replace Lead as well as contribute to the machinability of the finished alloy. Alloys containing Bismuth and Tin are one of the more widely used substitutions for products that previously used Lead. The industry refers to low-melting alloys comprised of 58 percent Bismuth and 42 percent Tin as Tru Alloy. Tru Alloy is one of the safest low-melting alloys to work with since it does not contain Cadmium or Lead. Because it melts at approximately 281 degrees Fahrenheit, it is used for fusible plugs that protect components on boilers, oil tanks, and machinery from overheating. It also can be used for Lead-free, Cadmium-free solder applications and Lead-free jewelry for children. Bismuth is available in high-purity forms or commercial grades, and experienced alloy producers can create custom combinations to meet application requirements, which feature Bismuth alloyed with Antimony, Lead, Cadmium, Tin, Copper and Indium.